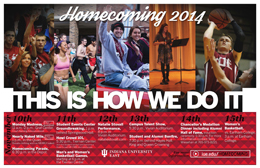 Indiana University East will host “Homecoming 2014: This is How We Do It” November 10-15. Alumni, friends and the campus community are invited to participate in the activities and events throughout the week. Homecoming events are sponsored by the Alumni Association, Office of Campus Life, Student Activities Advisory Team, Student Government Association, and Students Today Alumni Tomorrow. 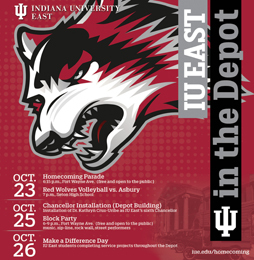 Indiana University East is planning several events in Richmond’s Historic Depot District during its 2013 Homecoming week, October 21-26. 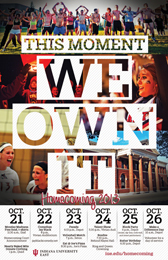 Indiana University East will host “Homecoming 2013: This Moment We Own It” October 21-26. Alumni, friends and the campus community are invited to participate in the activities and events throughout the week. Homecoming events are sponsored by the Alumni Association, Office of Campus Life, Student Activities Advisory Team, Student Government Association, and Students Today Alumni Tomorrow. Neon Trees will perform in concert Thursday, April 11, announced today by Indiana University East and the Student Activity Advisory Team. The doors will open at 7 p.m. with the concert starting at 8 p.m. and will be held at the Richmond High School Tiernan Center. 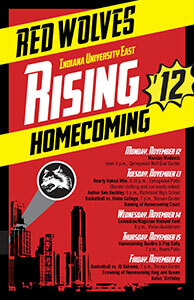 Indiana University East will host “Homecoming 2012: Red Wolves Rising” November 12-16. Alumni, friends and the campus community are invited to participate in the activities and events throughout the week. Homecoming events are sponsored by the Alumni Association, Office of Campus Life, Student Activities Advisory Team, Student Government Association, and Students Today Alumni Tomorrow. Indiana University East will celebrate the start of the fall semester with new and returning students during the annual Back with the Pack August 28-30. The three-day event is sponsored by the Office of Campus Life. Fall semester classes start today (Monday, August 27). The Indiana University East Alumni Association invites alumni back to campus for a fun and innovative event, “Reconnect 2012,” from 10:30 a.m. to 1 p.m. on Saturday, April 28, in the Graf Center in Springwood Hall.